New Urban Arts kicks off its program year with SAMPLE WEEK! New Urban Arts programs will officially open on Tuesday, October 9, 2018. 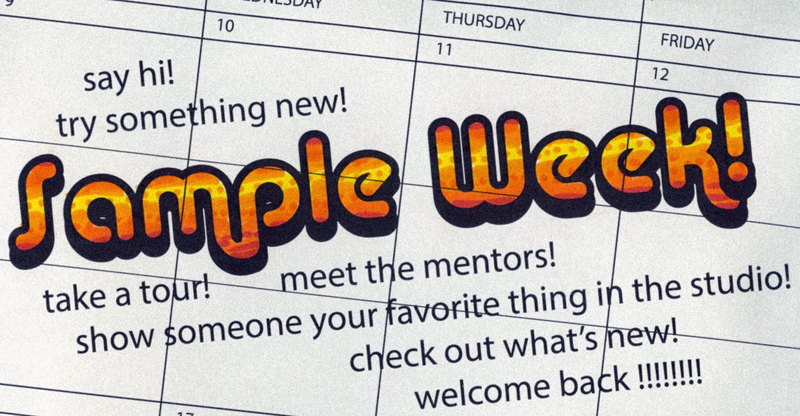 High School students are invited to join us for Sample Week, an opportunity to tour the studio, meet our new mentors, and try on a little of everything we have to offer. Have you been curious about screen printing? Come pull a screen and take home a Sample Week print. Have you ever played a drum solo in the music studio? Come jam out on an instrument and see how it feels. Want to learn more about college and career opportunities? Come meet our A Life After School Coordinator. New Urban Arts’ Youth Mentorship in the Arts program will run from October 9 – May 17th, Monday – Friday from 3-7pm. Founded in 1997, New Urban Arts is a nationally-recognized community arts studio for high school students and emerging artists in Providence, Rhode Island. Our mission is to build a vital community that empowers young people as artists and leaders to develop a creative practice they can sustain throughout their lives. Check out there Facebook event page, here!